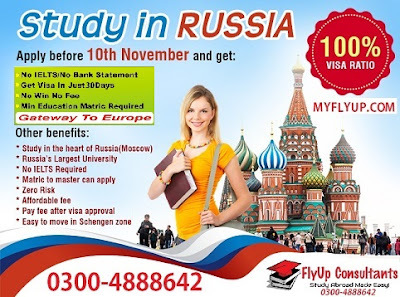 Study in Russia consultants in Pakistan is a vibrant overseas education & immigration consultancy company. Working since April 2014. Our business philosophy in the education sector is to serve as a bridge between students and universities so as to help students select the best foreign institute according to their academic requirements. Russia consulting aims to advance the profession of education consultancy by establishing high standards of performance. Its a big opportunity to Study in Russia for Pakistani Students - Take our Consultation to Study in Russia. Details for Russian Student Visa and Russian Student Visa Application and Requirements. Study in Russia consultants aims to advance the profession of education consultancy by establishing high standards of performance. Having live experiences in problem-solving, and practical knowledge of trends, patterns and data in the ever-changing admissions and visa process, education and career industry, we help our clients to overcome all major obstacles which are faced while undergoing education process abroad. If you are contemplating the idea of moving abroad, do not think twice and let us help you in interpreting your dreams into reality through our expert immigration services where our goal is simple: give you a completely unbiased and impartial advice and provide you best of service regarding Study in Russia. Common Russian Student Visa is issued to Pakistani citizens, citizens of other countries and stateless persons who seek to enter the Russian Federation for purpose of studying at educational institutions, and is granted on the basis of an invitation issued by Federal Migration Service of the Russian Federation (FMS of Russia) or a visa directive sent by the Ministry of Foreign Affairs of the Russian Federation. Student visa can be single-entry or double-entry. Subsequent extension of the student visa for Russia is granted by the Federal Migration Service of the Russian Federation (FMS of Russia) at the place where the foreign citizen resides and is registered with the local FMS branch. The foreign citizen is issued a multiple-entry visa valid for the period specified in the study contract entered into in accordance with educational legislation of the Russian Federation, but no more than for one year for every subsequent visa. Pupils, students, PhD candidates and accompanying teachers who are going to the Russian Federation for studies or internship (including participants of exchange and other educational programs) may submit a letter of invitation*, confirmation of enrollment from the receiving university, academy, institute, college or school, or a student ID card, or a confirmation of enrollment for the academic course to be attended. To apply for Russian Student visa, an applicant should submit a completed visa application form, national passport, one standard picture, Money Order (see points 1-4 of General Information), as well as: Original letter of Invitation from your Russian host organization must be issued by the Federal Migration Service or its local office. Original HIV blood test (AIDS) Certificate. This certificate is valid for 3 month only (HIV blood test should be taken not earlier than 3 months before applying for a visa). If you submit the documents for work or student visa, please be aware that the national passport has to be valid for not less than one and a half-year. Russian Student Visa Application and Requirements - There are more than 600 universities and hundreds of private institutes in Russia offering educational facilities to international students. There are many undergraduate options for study in Russia for international students. Russia is now been a member of European Higher Education Area, this mean that the Russian educational institute had now begun to provide the western standard education in its institutes. To be eligible for study in Russia, the person had to send apply for any particular course at a Russian educational institution; this will help you get a secure place in the Russian educational institute. When you had once applied with the completely filled admission form along with the document required with the application form, they will then send you an official invitation, if you are up to the mark of the course you had applied for. This invitation letter is a basic and most important key part of your Russian student visa application. Valid National passport with at least 2 blank pages for visas. Two professional photos on a white background. Proof that you had paid your tuition fee and other basic fees to the college you are going to study in. Written proof from the college as you letter of acceptance- it should be on the letter head of the college and should clearly mention the college name and other basic details. Official HIV (AIDS) Test Certificate. Proof showing that you have some amount with you to help your stay in Russia. Student visa is issued only for students, who come to Russia for study purpose. This is the best visa type of stay in Russia but you will get it only when you are registered in the university/college in Russia. Getting yourself enrolled to Russian college need the simple step of applying in your desired course and getting the approval letter. After getting the letter from the college/university you had to apply for the visa registration in Russian consulate or embassy at your area. Once you had submitted you visa application along with all the documents required for the processing you will be updated soon as your application is processed. If your get approval, you will receive a copy of visa. When you reach Russia you will need a registration over there. The process for visa registration is very easy you will just need your passport with Russian visa and migration cards (that you get at the border) and the universityâ€™s â€œforeign departmentâ€ will submit your documents to immigration officials to register your visa. The process of registration takes almost a week time to get completed. Normally, the registration can be done for the period of your visa; but in case if not , it will be relatively easy to prolong it if youâ€™re still studying in the university. Student Visa is issued within 3 to 10 days and is valid for single entry only. For single entry, the visa fee for 10 days is around $70 as for as for 3 working days processing of visa the fee is 140$. Visa processing will not start until the consulate had received the necessary documents. Scholarships are available in different colleges and universities. Study in Russia cost depends on college and university. Usually tuition fee is between 3000 to 5000 Euros. Please check the list of universities and colleges in this website. Yes they can work in Russia after completion of 1st semester of their course.